​Tane Mahuta is the largest living Kauri tree and grows a short two minute walk off the twin coast highway in the Waipoua Forest sanctuary. It has an estimated age of 1200 years, a girth of 14 metres and a height of 51 metres. The volume of timber is approximately 245 cubic metres which is about 100 times that of the average plantation pine tree! 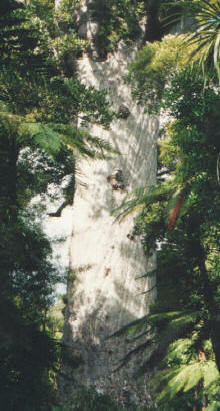 The Kauri, are considered by New Zealanders to be the greatest trees in the world. They can live to be 2000 years old and have been recorded as much as 4000 years old. The are second in size only to the giant sequoias of California. The larger trees have an impressive trunk which does not taper towards the tip – in some cases they even broadening where the trunk joins the branches. The branches are formed high on the trunk thereby producing large volumes of high quality clear timber. Where once the Kauri grew prolifically in the northern half of the North Island they are now mainly confined to forests and reserves. Earlier in history, vast areas of bush were cleared and burnt by both the Maori and the early European settlers to make way for farmland. Only those areas where access was difficult have the Kauri survived in any numbers. The Kauri forests had managed to survive even ancient natural disasters. Great areas of forest have been destroyed and later covered by sand, remaining buried to this day. There are many theories about what might have caused these mass destructions, some of which have been outlined in the Ancient Disasters. In some cases, the wood, leaves and bark have been perfectly preserved, even retaining some of their green colour for a few minutes after exposure to the air. The polished timber has a three dimensional glow and ranges in colour from a light honey shading through to a light brown shade. Kauri timber that has been buried in peat swamps is sometimes stained to a dark brown walnut shade and is prized for crafts and furniture (although it is more difficult to work than ordinary Kauri). Today the Kauri trees are limited to a few reserves – they are now absolutely protected. These majestic tress are now attracting many visitors to the natural forest areas and have brought a new awareness about the need for conservation – not only for the Kauri but for all our native treasures.